A great recipe for enjoying the outdoors from our crew to your crew. These kebobs offer plenty of flavor and nutrition. A favorite here at Turf Medic, they go extremely well with a day relaxing in the yard or poolside. They’re simple to make and pair great with any side! Enjoy. Combine sugar, soy sauce, onion, garlic, lemon juice, olive oil, thyme, and pepper in a mixing bowl. Pour into a zip-lock bag and add pork pieces. Seal bag, mix thoroughly, and refrigerate for at least 1 hour, turning bag on occasion. Remove pork from bag and reserve marinade. Thread 5 pork pieces, 4 watermelon cubes, 2 to 3 zucchini rounds, 2 pineapple chunks, and 3 peppers on each of 8 skewers, alternating the order. Spray cooking surface and place kebobs on grill. Grill for 12 to 15 minutes, depending on grill heat, or until done, turning and basting frequently with reserved marinade. 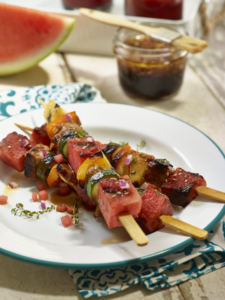 Garnish with sesame seeds and chunks of watermelon. Copyright © 2019 · Turf Medic Lawn & Landscape, Inc.